A database administrator (DBA) has a challenging job trying to maintain databases in today’s nonstop 24x7 environments. This challenge is compounded by the complexity of database structures and the time pressure of trying to be up again as soon as possible without making mistakes. When business expands, several DB2 subsystems have to be maintained, such as multiple development systems, function test, acceptance test, volume test, and production systems. Often changes have to be implemented across multiple DB2 subsystems. The two IBM DB2 for z/OS tools that help database administrators to implement database changes are the DB2 Administration Tool and the DB2 Object Comparison Tool. In this IBM Redbooks publication we show how, with Version 7.2, the two tools offer an enhanced Change Management function to manage and track the changes of your DB2 objects. We show how the tools help you define changes, resolve conflicts, register the changes, analyze the changes to generate a work statement list that applies the changes, and then run the changes in the correct order. The Change Management functions also allow you to back out completed changes and facilitate the management of a convenient audit trail. 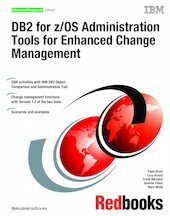 This book contains a major update to the Change Management functions described in DB2 for z/OS Tools for Database Administration and Change Management, SG24-6420-01.